For a time it looked as though Britain was back on course for the old make-do-and-mend approach of patching up the existing road network with piecemeal widening, bypass and improvement work. It was all that the struggling post-war Government could manage to resume regular maintenance, so a network of brand new superhighways looked highly improbable. But pressure was building, not least from Lancashire County Council where James Drake had taken up the post of County Surveyor and Bridgemaster in 1945. 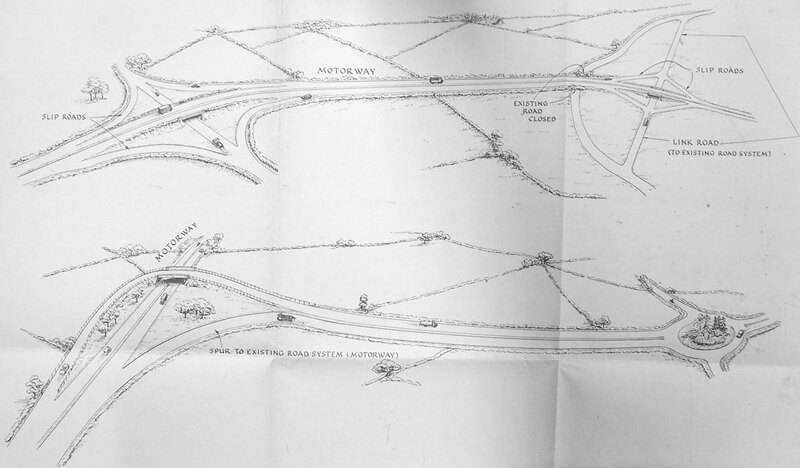 His Road Plan for Lancashire, published in 1949, called for investment across the county, not least in the revived north-south motorway (shown left; click to enlarge) that his county had been promised before the war. While no funding could be secured, the Ministry of Transport decided that it ought to work its way through the legal problems that stood in the way. The Treasury was informed that there were no legal powers to acquire land for roads that were for use by limited types of traffic, and they would be required should the Government decide to build a network of motorways. The original Motorway Bill first came before the Coalition Government in 1945, but was rejected before its first reading because the Commons was overrun with more important matters. Its second coming took a number of years. On 2 August 1946, the policy to produce a Motorway Bill was adopted, but curiously, the policy to actually build motor roads was not. The Bill was only there just in case. Its low priority meant that it only came before Parliament on 30 September 1948. Its purpose was "to provide for the construction of roads reserved for special classes of traffic; to amend the law relating to trunk roads; and for purposes connected with the matters aforesaid." The Motorway Bill turned into the Special Roads Bill when it received Treasury approval in October 1948, and in 1949 became the Special Roads Act. The power for motorways now existed. All that was needed was the will to build one. The country's civil engineers were also working to decide what form a motorway might take. In 1945, the Institution of Automobile Engineers published a joint report with a number of other bodies that suggested a design speed of 75mph (though they thought it unlikely that traffic would travel at more than 60mph), with 1ft (30cm) marginal strips at each side of each carriageway, and lanes 11ft (3.3m) wide on two-lane carriageways and just 10ft (3m) wide on three-lane carriageways. They also recommended parking places where drivers could rest, preferably located at viewpoints. By the fifties, design was in the Ministry's hands, and continuing pressure from various parties (principal among them the British Road Federation and James Drake at Lancashire County Council) meant that official standards were going to be needed sooner rather than later. The Ministry settled on a 70mph design speed and 12ft (3.6m) lanes, though not a paved hard shoulder. This thrilling new type of road was causing a certain amount of confusion. The Ministry of Transport and Civil Aviation was in regular correspondence with many civil engineers across the country and found that they were all confusing each other with different terminology. The Ministry's Deputy Chief Engineer cleared things up with a memo in 1956 that set out three vital terms, helpfully providing drawings of them so there could be no confusion about this most technical of matters. "The following definitions have been agreed between Highways Engineering and Trunk Roads Division... in future, as and where applicable, [engineers] should prepare [their] submissions based on these definitions. Slip-roads: these are the connecting links between Motorways and existing highways and are provided at all points where physical connection between the two highways is provided. They are always part of the junction design and are usually, but not necessarily, one-way. Link road: a new section of all-purpose road connecting an existing highways with the Motorway via the slip-roads. Spur: a branch of the main Motorway carrying traffic from a main motorway towards another part of the existing highway system." "The cost of a motor road with eight points of connection and with a high level bridge over the ship canal would be about £9 million... [this] is what we are planning for at the present, and it does not on the face of it seem very suited for a toll project." His reasoning was quite simple, and came from a developing consensus at the time: that tolls would prevent a new road from being used to its fullest potential. It was a view shared by Drake, who rather more succinctly stated that "if I build a motorway, I want people to use it!" First, of course, he had to build one.